Thailand's Phi Phi Islands are located in the Andaman Sea southeast of Phuket. The islands’ ecology is under constant pressure from tourists, divers, and local fishermen, as well as from natural disasters, such as the tsunami that struck in 2004. This composition pays tribute to the precious natural beauty of the island’s limestone mountains, caves, and clear waters. 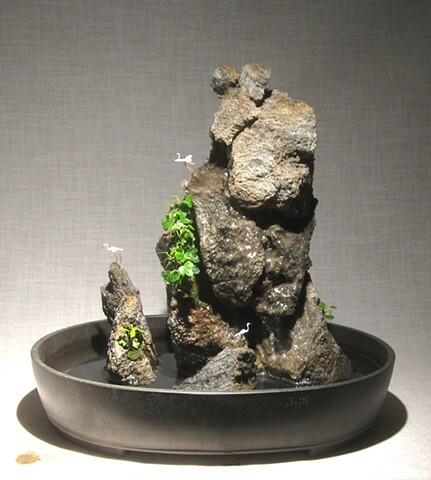 The islands’ flora and fauna are reflected in the miniature birds and the dwarf ivy climbing the rock faces.